ANKARA/AFRIN, Syria (Reuters) - Turkish forces will press their offensive against Kurdish YPG fighters along the length of Turkey's border with Syria and if necessary into northern Iraq, President Tayyip Erdogan said on Monday. After seizing control of Afrin, the main town in a pocket of Kurdish-controlled territory in northwest Syria, Erdogan said Turkey would also target a region stretching nearly 400 km (250 miles) east to the northern Syrian town of Qamishli. It launched the air and ground offensive two months ago against the YPG in Afrin, a campaign it dubbed "Olive Branch". "By controlling Afrin city centre yesterday, we have passed the most important step of the Olive Branch operation," Erdogan told a gathering of judges and prosecutors in Ankara. "After this, we will continue now to Manbij, Ayn al-Arab, Tel Abyad, Ras al-Ain and Qamishli until this corridor is fully removed," he said, referring to a string of towns along Syria's border region with Turkey. Turkish authorities have described the stretch of northern Syria under Kurdish control as a "terror corridor" on the long southern border. YPG officials have said their focus is on guaranteeing legal and constitutional rights for Syrian Kurds. "The Free Syrian Army came and entered into Afrin and supposedly we were going to be safe. But it turned out to be the opposite," said the man, who did not give his name. Erdogan's spokesman told CNN that Turkey was taking the reports of looting seriously and that some fighters had not apparently followed the orders of their commanders. A political affiliate of U.S.-backed, Kurdish-spearheaded militias accused Erdogan seeking to attack "under false pretences" swathes of northern Syria. The United States called for those in the area to remain focussed on defeating Islamic State, de-escalating conflict and protecting civilian lives. The U.S. State Department also called for international aid organisations to be given access to deliver humanitarian assistance in the area. Turkey is concerned about the presence in northern Iraq of militants of the Kurdistan Workers' Party (PKK) which has waged the insurgency in Turkey since the 1980s. The PKK has been based in Qandil mountain region near Iraq's border with Iran, but Erdogan said a "second Qandil" was being established in Sinjar, further west. Turkish Prime Minister Binali Yildirim was holding talks with the Iraqi government, Erdogan added. "However, if this issue is prolonged much longer there will be an Olive Branch there too." Earlier on Monday government spokesman Bekir Bozdag said Turkish forces would return Afrin to its "real owners" after driving the YPG out. A Syrian Kurdish official told Reuters that more than 200,000 people who had fled the Afrin offensive were without shelter, food or water in nearby areas. The International Committee of the Red Cross (ICRC) called for greater access to the civilian population of Afrin. It said the Turkish Red Crescent aid group lacked credibility among Syrian Kurds after Turkey's military operation. Turkey's emergency aid agency AFAD sent a convoy into Afrin town centre on Monday and distributed Turkish Red Crescent materials including food, water and hygiene products. 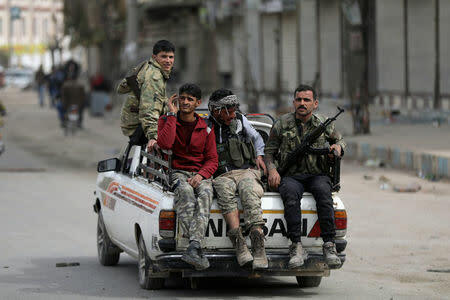 The Afrin campaign was Turkey's second cross-border operation into Syria during the seven-year-old civil war. The first, dubbed "Euphrates Shield", targeted Islamic State and Kurdish fighters further east than Afrin. After the completion of Euphrates Shield in early 2017, Turkey set up local systems of governance in the swathe of land captured, protected by Turkish forces. Bozdag said Turkey now aimed to form similar systems in Afrin region.